Make sure to get your submissions in before the deadline of 3 May for the 28th ICDE World Conference. Join the ICDE community of passionate advocates who work towards a common goal - to bring accessible, quality education to all. Contribute directly to changing the way the world tackles providing quality education to some of the worlds poorest through distance learning. We provide an international platform for cooperation on innovation and development, featuring key regional actors and leading experts. We provide access to hundreds of higher education institutions, multiple networks and systems that impact millions of students worldwide. The International Council for Open and Distance Education (ICDE) is the leading, global membership organisation that works towards bringing accessible, quality education to all through online, open and distance learning. Our members are from all regions of the world. They are change makers who network and collaborate to share their expertise, insight and resources to take on one of the worlds toughest challenges - to bring inclusive, flexible and quality learning and teaching to all in the digital age. Join the ICDE community of passionate advocates as they work towards this one common goal. ICDE was founded in 1938 in Canada as the International Council for Correspondence Education. Over 80 years later the global community of ICDE continues to works together to meet the new global challenges presented by the knowledge intensive economy and digital transformation. Our members have an estimated 15 million+ students enrolled across 6 continents. 190+ higher education and research institutions in over 70 countries are part of the ICDE global community. ICDE has collaborative partnerships with 18+ organisations around the world all working towards a common goal - accessible, quality education for all. ICDE represents its members and provides advocacy and leadership around the advancement of online, open and distance learning. The ICDE community together undertakes a number of activities and projects that contribute towards the global mission of the Sustainable Development Goal 4 (SDG4) - Ensure inclusive and equitable quality education and promote lifelong learning opportunities for all. SDG4 is part of the 2030 Agenda for Sustainable Development, adopted by all United Nations Member States in 2015. At its heart are the 17 Sustainable Development Goals (SDGs), which are an urgent call for action by all countries to recognise that ending poverty and other deprivations must go hand-in-hand with strategies that improve health and education, reduce inequality, and spur economic growth – all while tackling climate change and working to preserve our oceans and forests. ICDE facilitates partnerships and cross border collaboration through events, specialist networks, projects and task forces. 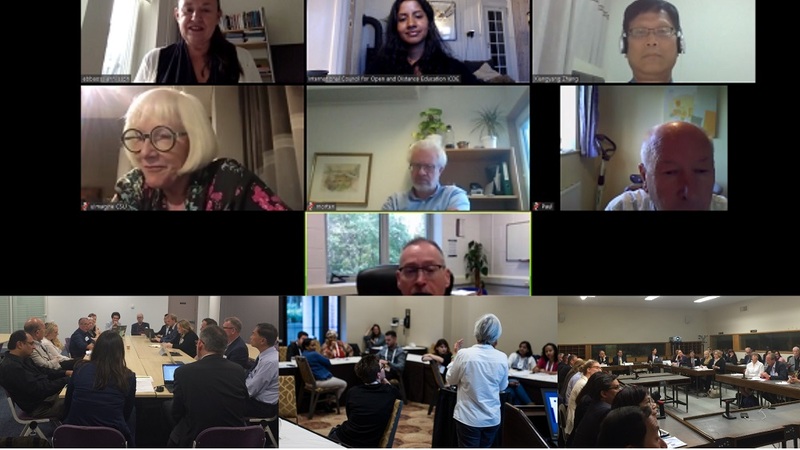 Events and specialist networks enable the ICDE community to connect, share, learn and undertake research and innovation activities to further the development of online, open and distance education. ICDE expert group members from all regions, share scientific, practical and regulatory expertise on many subject areas relating to the advancement of quality, accessible, online, open and distance education. *All committee members are approved by the ICDE Executive Committee. The ICDE OER Advocacy Committee works to increase global recognition of OER; and to provide policy support for the uptake, use and reuse of OER. The Focal Points on Quality (FPQs) have a leading and coordinating role for quality work in their respective regions. The Research and Innovation Task Force force was set up by the ICDE Executive Committee in January 2016 with the mandate to encourage the development of best practices and standards in open, distance, flexible and online education, including e-learning. The Global Doctoral Consortium (GDC) is a global initiative supporting doctoral students in the research field related to online, open, flexible and technology enhanced learning. Once a year, ICDE invites member Presidents, Rectors and Vice Chancellors (or their formal replacement) and the heads of distance education departments to attend the closed Presidents’ meeting. The ICDE Research and Innovation Taskforce conducted research in 2014 to better understand the state of research and innovation in open, distance, flexible and online education, including e-learning across ICDE members. Member institutions and international, regional organisations collaborate to share the latest developments from all regions to share knowledge & inspire others.